Since about 4 months I engage myself in mind mapping. I admit, I am still a newbie. But not to be on the inside track may be an advantage when talking about mind mapping. Regarding to my blog about Apple’s iOS devices I tried to mind map features of apps (summarizing textual descriptions) as well as suitable configurations of Apple’s devices for private and business use (creating overviews of the application of technical products). This works fine and I see great benefits because these descriptions are easier to understand, enforce the creativity, sort out features which are not important, and stay in mind for a longer time then written text. But I also recognized lacks in the technique. If I review mind maps on Biggerplate.com I often don’t know why the author uses a special color for a branch, a formatted text or an image for any reason whatsoever. Only a few authors describe the meaning of the colors they used when creating maps. There are no common accepted rules to highlight the very important points. Even the positioning of topics is somewhat subjective. 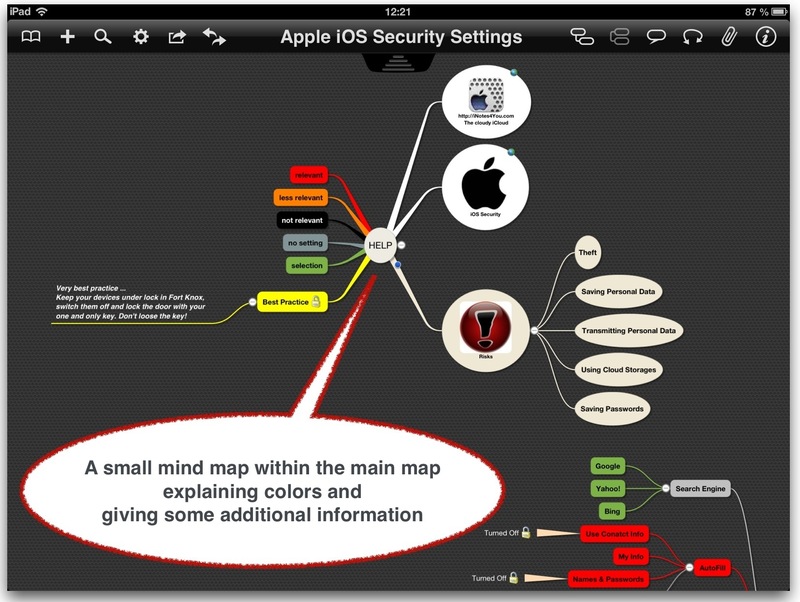 Here is a mind map I created for Apple’s iOS Security Setting containing another mind map which explains the layout. During brainstorming we all have basic and alternative ideas. Without a standardized comment it’s not possible to distinguish between them. There are more and less important branches. Some authors try to number the important branches and set e.g. a grey color without numbering to less important branches. But there is no standard. Creating a map about more subjective things sometimes causes a lack of comprehension. In some cases it’s simply not possible to hone thoughts down to essentials without comments. Consider a database with a table containing different properties of social networks like date of foundation, number of members, etc. Queries on the tables of this database can extract data from different point of views e.g. a list sorted by the number of members. For mind maps there is no functionality available which reorganizes content with an alternate point of view. So mind maps are static because of the limited properties of each topic. Basically just the formatting can be set. Are the different file formats to tie the customers to the software developing companies? With a standardization some of the above mentioned problems could be solved at one go. It’s admittedly not only a problem of mind mapping software but also of text processing, databases, images, videos etc. But why shouldn’t developers of mind mapping software show the world how to go the better way to avoid all the problems and the additional expenditure of time converting between formats? A bit more complex mind maps are not distributable using other formats like those of Keynote, Powerpoint, Pages, Word, PDF. The problem is the space they need if they are expanded to display all branches in details. So, unlike text documents, mind maps stringently require a device with a suitable software application. There is no way to distribute essential information to employees in bigger companies without expecting a device. Nearly everybody owns an appropriate device these days but not everybody wants to use it all the time. Some mind mapping tools allow to generate a Powerpoint/Keynote presentation or a Word/Pages text document. But if you do so some of the main benefits of mind maps get lost. 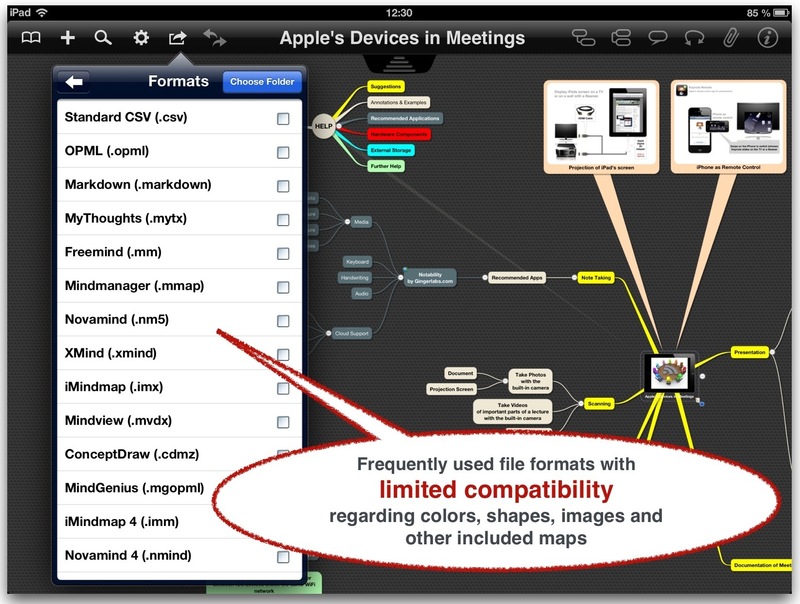 See these exports of a mind map to Apple’s iWork apps Pages and Keynote. Due to this limitation the relevance of a standardized file format becomes indispensable. A de-facto standard like PDF, suitable for mind maps, would help to further increase usability, sharing, and collaboration. It’s nearly impossible to print out mind maps in total because of the space they need. You can find many websites about mind mapping but none of them uses elements of the mind mapping technique to set up a clear design by summarizing the content and act as a navigator for the different topics. So my conclusion is that it is not possible to use mind maps effectively on websites. It’s again a question of space and possibly of search engine friendly programming . There is a company named Context Discovery Inc. located in Canada which tries to summarize information and present the result as a mind map, a tree view, or a keyword cloud. As tablets are steadily gaining popularity techniques must be developed to support the form factor of these devices. I cannot see that there is any benefit of using mind maps on tablets compared to the more traditional way of displaying text clarified by informative images. For me it’s mostly a question of the website design which provokes all the problems of displaying content in a clear and user-friendly way. I think you agree with me that too many websites are Double-D sites which means Design-Disaster sites and additionally filled up with ad which reduces space still more. If the technique of mind mapping goes widely into education the time will come to instruct the pupils and then some rules are indispensable. Tony Buzan, often quoted as the inventor of mind mapping suggests the following ‘guidelines’ for creating mind maps. 01 Start in the center with an image of the topic, using at least 3 colors. 02 Use images, symbols, codes, and dimensions throughout your mind map. 03 Select key words and print using upper or lower case letters. 04 Each word/image is best alone and sitting on its own line. 05 The lines should be connected, starting from the central image. The central lines are thicker, organic and thinner as they radiate out from the centre. 06 Make the lines the same length as the word/image they support. 07 Use multiple colors throughout the mind map, for visual stimulation and also to encode or group. 08 Develop your own personal style of mind mapping. 09 Use emphasis and show associations in your mind map. 10 Keep the mind map clear by using radial hierarchy, numerical order or outlines to embrace your branches. These guidelines have to be extended to prevent that the creation process gets out of hand. It’s unrewarding that all the authors set their individual standards for published maps. Wouldn’t it be a good idea to discuss these problems at upcoming conferences about mind mapping? It’s the task of the leading mind mapping platforms to go ahead and initiate a round table with developers and prominent mind mappers. Maps are in the majority of cases are useful just for the author because a viewer cannot necessarily follow all thoughts of the author at the time he created the map. Maybe the author himself gets problems when he looks at his map months later. Most of the maps are dedicated just for personal use. The public often is impressed of maps but it’s doubtful if viewers understand their meaning.